Scotland and northern England are set to feel the worst of the blizzards when they hit on Saturday. Yellow alerts are in place for most of the weekend, with the Met Office forecasting a major chill. Snow, freezing rain and black ice are all expected. How much snow will fall? According to The Weather Channel, up to eight inches of snow could settle in some parts. A spokesperson said: “Snow accumulation in the British Isles is expected to be about 7cm on the Pennines with 12cm on Scotland Highlands in blizzard conditions. Met Office forecaster said: “We are expecting some severe weather over the next couple of days, especially on Saturday. 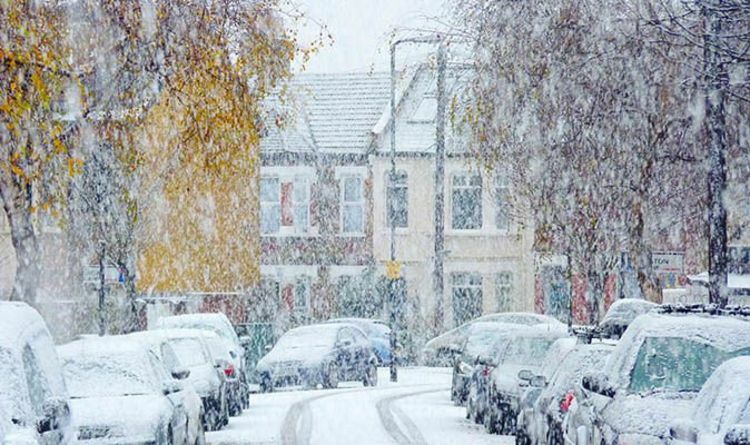 “As this weather starts to move in and the hit the cold air across the UK, particularly on Saturday, it will in some places start to turn to snow. “If you are going Christmas shopping there could be travel disruption and even interruption to power supplies. Which areas are under Met Office warning? The Met Office has issued a yellow warning for snow and ice, which is in place between 12pm on Saturday December 14, and 10am on Sunday December 15. The regions affected are: Central, Tayside & Fife; East Midlands; Grampian; Highlands & Eilean Siar; North East England; North West England; SW Scotland, Lothian Borders; Strathclyde; Yorkshire & Humber. The agency is warning residents to prepare for travel delays, possible power cuts and the risk of slips and falls on icy surfaces. “Untreated pavements and cycle paths might be impassable because of black ice,” said the Met Office. The forecast expects the snow to be heavy at times, especially over hills where blizzards may develop, and is likely to drift in strong winds. Across northern England and southern Scotland, snow may turn to freezing rain above 200 to 300 metres leading to widespread ice developing on Saturday night. The rest of the UK will see rain during the day with temperatures struggling to get above 0C. Forecasters have urged people to keep an eye on the weather warnings.